(Voice over Internet Protocol) VoIP Market size is set to exceed USD 55 billion by 2025; according to a new research report by Global Market Insights, Inc. 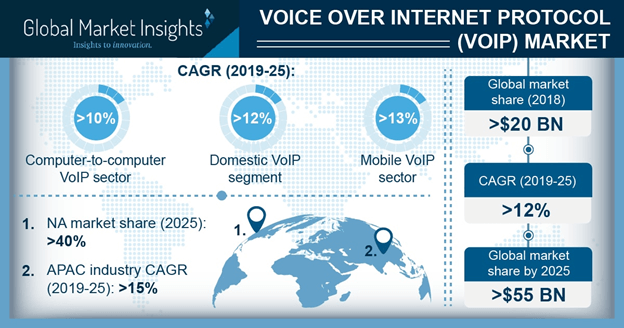 The VoIP market is expected to witness a significant growth from 2019 to 2025 as the technology enables a cost-effective way of communication compared to a broadband internet connection. The technology is rapidly replacing expensive traditional phone services as it eliminates the need to invest in massive telecom hardware equipment. Extensive internet penetration and widespread adoption of advanced unified communication platforms to support the growing business requirements will also contribute to the rising adoption of VoIP. As the enterprises are focusing on geographic expansion, they face tremendous pressure to improve internal & external communication and collaboration among remotely dispersed workforce. This leads to the adoption of VoIP solutions including IP phones and web-based applications, which facilitate cost-effective communication. The technology enables functionalities, such as voice calling, video calling, and instant messaging, at a very low cost. The integrated access/SIP trunking segment held a dominant share of over 52% in 2018 and will maintain its leading position in the VoIP market by 2025. The integrated access devices/SIP trunking services are widely adopted by the enterprises as they enable them to integrate their existing, legacy phone systems with VoIP software. To utilize the benefits of advanced communication services, enterprises make use of these platforms designed for converged voice & data services including internet access and video applications. The phone to phone VoIP market will witness the fastest growth rate due to extensive use of IP phones enabling long-distance communication at an affordable price. IP phones offer call waiting and advanced call routing compared to traditional analog phones. These systems enable enterprises to scale their communication infrastructure depending on their changing infrastructure requirements without paying for procuring costly infrastructure components. The international VoIP calls market is projected hold a major share of over 50% by 2025. The demand for international VoIP calling services will increase as they enable huge cost-savings for enterprises who have their offices and customers across remotely distributed locations. Several affordable international calling plans or plan extensions are being offered by VoIP service providers, enabling organizations to conduct business across borders at low calling rates. The fixed VoIP segment will hold a voice over internet protocol market share of around 55% by 2025 as enterprises prefer a secure phone system, which utilizes internet connectivity and offers more safe and convenient communication. Fixed VoIP is registered with an address, which can be traced back to the phone line and uses stringent security protocols, which prevent user’s phone number from being misused. SMBs are projected to exhibit an accelerated growth of over 15% in the VoIP market from 2019 to 2025. The growing trend of workforce mobility and budgetary constraints compel the SMBs to look for effective ways to reduce telecommunication expenses. They are widely using softphones and IP phone systems that can be easily configured to support several phone lines as per each user’s requirements. To reduce equipment implementation, maintenance costs, and expenditure on IT staff training, the SMBs are rapidly switching to cloud PBX systems managed by the VoIP service providers. The IT & telecom VoIP market will hold the largest market share of over 25% by 2025 as huge investments are being made to improve the telecommunications infrastructure to support VoIP services. The telecom companies are making huge investments in 4G technology and expanding their 4G coverage to enable the deployment of VoIP services. For instance, in November 2016, Orange Spain launched a nationwide 4G LTE service. The service helped in offering better voice quality and faster call setup for Spanish customers. Numerous startups in the IT sector are adopting cost-effective voice communication solutions to reduce the expenditure on IT infrastructure deployment. As an effective team collaboration and on-demand network availability are the key requirements of the enterprises operating in the IT & telecom sector, the demand for VoIP will increase over the forecast timespan. North America is projected to dominate the VoIP market in 2025 with a share of over 40%. Huge adoption of cloud services, advanced telecommunications infrastructure, and rising popularity of workforce mobility will support the market growth. Enterprises in the region are migrating from traditional PSTN network to cloud-based telephony to reduce hardware dependency, increase scalability, and improve collaboration. For instance, in October 2017, Dialpad introduced its cloud communications platform and expanded its footprint to serve companies in Canada. By opening a new office in Vancouver, the company enabled SMBs and large enterprises to modernize their cloud infrastructure. The companies present in the VoIP market are focusing on offering new products and services to gain more market share. In December 2018, Panasonic introduced new Panasonic KX-NT680 and KX-NT630 IP phones to facilitate intuitive communications. The new phones offer clear voice quality, echo cancellation, and encrypt communication packets to establish safe communication channels. Some companies are engaging in strategic partnerships and acquisitions to expand their communication solutions portfolio to cater to a wider set of audience. For instance, in January 2017, 3CX partnered with VoiceMeUp to provide customized telephony solutions for SMEs. This collaboration empowered users to streamline their cloud-based enterprise communication capabilities. As the demand for VoIP solutions will increase, the competitive landscape is expected to become more intense as the players will focus more on product differentiation to stay ahead of the competitors.